Here you can find all the information about the store AEON - Shopping centre AEON Permas Jaya - No 1, Jalan Permas Jaya Utara Bandar Baru Permas Jaya . 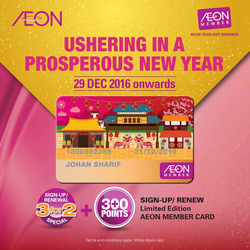 Opening hours, AEON phone number, AEON online store, location on the map and current promotions and Catalogue for this branch. Do you want to receive more offers from AEON by email?